XIAOMI LOFREE Jelly Bean Mechanical Calculator, new fashion design, intergenerational elegance and vintage, designed from traditional typewriter models. New fashion design, intergenerational elegance and vintage, designed from traditional typewriter models. High axis axle body, crisp sound, simple operation, continued the classic dot keycap design. Rounded texture, fashion and prcatical, made of ABS material, increase wear resistance and increase usage time. Smile design of the floor mat, the smile design on the calculator brings you a good mood for the day. 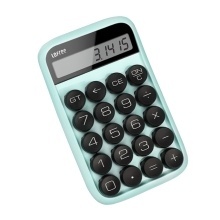 15° ergonomics design, effectively relieve eye fatigue in long-term use of the calculator.